If your headphone socket on your hw6900 iPAQ unit has failed, then this is the repair for you. The symptoms will be a lack of sound being heard through the headphones and or on occasion the main speaker does not function, this is a sign of a headphone socket jack failure. 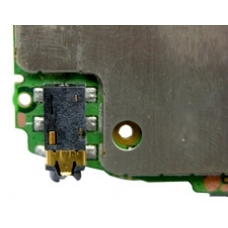 We will replace the headphone socket jack board with a new part and restore your iPAQ to normal working order. The audio jack connector is soldered to the top of the iPAQ mainboard. If you find your headphones stop working replacin..